Because this is a World Cup year, I have decided to countdown to the tournament by providing a short soccer/fitness related preview of each of the 32 participating nations. In this installment, I will look at Spain, the current World Cup holders, who are trying to become the first team since Brazil in 1958 / 1962 to repeat as World Cup champions. Spain has drawn a tough group that includes Holland, Chile, and Australia, and plays their first match against Holland on June 13th. In a recent study conducted by Castellano et al (2012), ball possession and pass completion percentage were rated as 2 of the 4 variable most likely to determine success of national teams at the World Cup (the other 2 were total shots taken, and shots on target). The Spanish national team consistently ranks as one of the highest in ball possession, and pass completion percentage, and they were the best team in both of those categories at the 2010 World Cup in South Africa (which they won). A high pass completion percentage is necessary in order for high ball possession to occur, and Spain have become masters at keeping more possession of the ball than their opponents, by completing many more passes than their opponents during games. From a physical standpoint, a team with more possession of the ball is able to rest more than its opponent. This does not mean that the team in possession does not run, because keeping the ball requires players off the ball to be moving constantly. What it does mean is that the opposing team, which will be spending much of the game defending, will expend more energy than the team in possession. Over time, this will cause the opposing team’s players to fatigue quicker, make more mistakes, and eventually concede goals that will likely cause them to lose the game. Spanish players and coaches have realized these facts, and have spent countless years developing a style of play that tires out and frustrates opponents by forcing them to defend for the majority of the game, often keeping them inside their own half and under constant threat of conceding shots on target. Interestingly, since shots on target was also one of the top predictors of success in World Cup games, the fact that Spain are able to keep so much possession of the ball in the opponent’s 1/3rd of the field has been instrumental in allowing them to generate more shots on target than most other World Cup teams. If Spain are to be successful this year, they will likely have to stick the the strategy and tactics that have worked so well for them for the past 6 years. Keep possession of the ball, complete more passes than the opponent, and try to do both of those things as close to the opponent’s goal as possible, which will allow for more shots on target. We will have to wait and see what happens in 3 months’ time. I’d love to hear your thoughts on this subject. Drop me a line here to get the conversation started. Remember the orange slices from your house league games? Most dieticians and fitness professionals tell people – even athletes – to limit their dietary intake of sugar, because consumption of excess amounts of sugar can lead to weight gain, diabetes, heart disease, and other negative health effects. For soccer players, however, there is one particular time and place that consuming sugar is actually good for you: half-time. Muscle glycogen, which is the body’s stored energy in the form of carbohydrates, can get significantly depleted over the course of a 90-minute soccer game. Several studies have even shown that more than 50% of the body’s muscle glycogen (stored carbohydrates) can be depleted by half-time. Unfortunately, once muscle glycogen in the body gets too low, optimal athletic performance becomes impossible as a result of muscle cramps, decreased strength and power, and aerobic fatigue. The good news is that the quickest and most efficient way for soccer players to restore muscle glycogen is to ingest carbohydrates in the form that is most easily absorbed into the body’s blood stream – sugar. 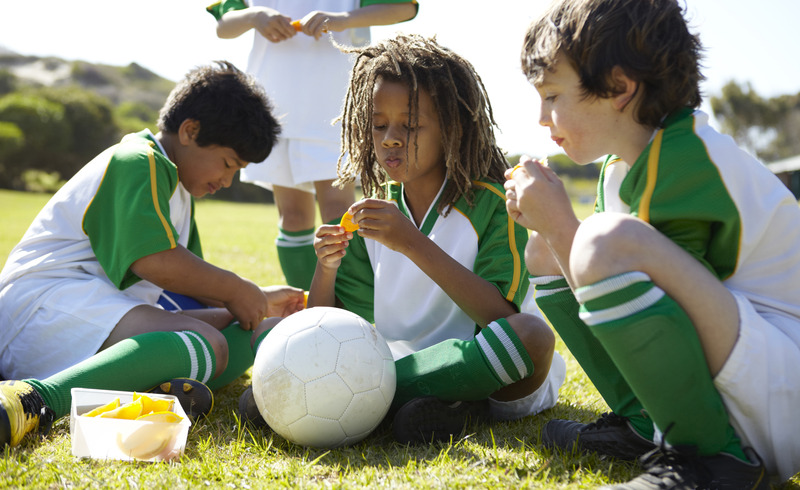 Furthermore, because half-time represents a natural, sustained break from play, it is the perfect time for soccer players to get the sugar their body needs. Now that you are aware of this good news, please use caution when deciding what type, and how much, sugar you will consume at half-time. In general, you will get all the carbohydrate replenishment you need with 1 regular sized handful of any of the above food items. Eat too much sugar at half-time, and you will probably just end up starting the second half with a stomach ache. I’d love to hear your opinions about this topic. Drop me a line here to get the conversation started. It might not be a bad idea for all soccer coaches, fitness coaches, parents, and players to read this article..
Getting it right: Why “talent selection” doesn’t work well enough. Because this is a World Cup year, I have decided to countdown to the tournament by providing a short soccer/fitness related preview of each of the 32 participating nations. In this installment, I will look at Cameroon, an African side with a German coach, who have a history of pulling off upsets in the World Cup and have drawn a tough group that includes hosts Brazil, Croatia, and Mexico. 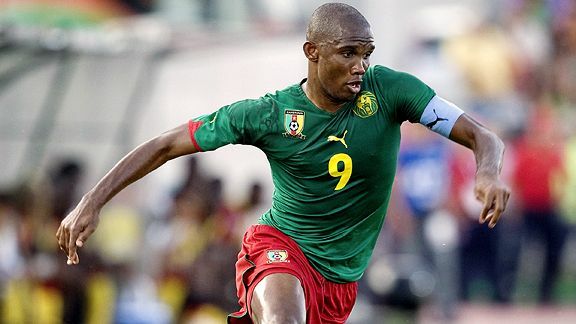 Of course, developing these skills and abilities takes years of hard training, however, soccer players aspiring to get faster should watch this video of Eto’o in action and try to copy the way he runs. At the World Cup Brazilian, Croatian, and Mexican defenders will certainly have their hands (and feet) full trying to stop him. We will have to wait and see what happens in 3 months’ time. A great exercise that combines single-leg balance and stability with upper body strengthening. To perform this exercise, stand on the middle of the Bosu Ball with your knee and toe pointing forwards. Hold dumbbells with arms at sides. Maintaining balance on the ball, slowly curl the dumbbells upwards by bending at the elbows. Position the dumbbells for a shoulder press by facing the palms outwards and fists towards the ceiling. Slowly press one arm upwards by straightening the elbow and bringing the dumbbell up and inwards towards the mid-line of the body. Keep balanced and slowly lower the arm back down, then repeat with the other arm. Perform 2 sets of 5-10 repetitions with each arm. Do the first set on the right leg, and the 2nd set on the left leg. Because this is a World Cup year, I have decided to countdown to the tournament by providing a short soccer/fitness related preview of each of the 32 participating nations. In this installment, I’m going to take a look at Mexico, traditionally one of the strongest nations in CONCACAF, who have qualified for 14 World Cups, and have not missed out on the tournament since 1990. They are in Group A (along with hosts Brazil, Croatia, and Cameroon). They play their first match against Cameroon on June 13th. Playing soccer in Mexico City, the nation’s capital, can be very tiring. I know, both because I played there myself in an international youth tournament in 1996, and also because I worked as Fitness Coach with the Canadian Women’s National U17 team during our training camp there in December of 2011 (where the team played two matches against the Mexican U17’s). The city is situated atop a small mountain, almost 2.5 kilometres above sea level. At such a high altitude, the partial pressure of oxygen in the air is much lower than it is at sea level, and as a result there is much less oxygen available for the body to breathe (and for working muscles to use). What this means for soccer players who travel to play there is that they will get tired a lot sooner during games than they normally would, and they also will not be able to recover as quickly between the runs they make over the course of a game. Mexicans who have grown up in the city, however, have spent their entire lives becoming acclimatized to the high altitude. Their cardiovascular and respiratory systems have gradually evolved to become more efficient at oxygen intake and delivery to working muscles. When these players travel and compete in parts of Mexico – or other countries – that are closer to sea level, their more efficient hearts and lungs allow them to perform better by improving aerobic endurance and off-setting fatigue. Sports scientists have coined the term “live high, train low”, to describe this very effective training strategy. Several research studies have shown significant improvements in aerobic endurance in athletes who have followed a “live high, train low” protocol, even in as little time as 4-6 weeks. For the Mexican National Soccer Team, the increased aerobic endurance gained from their acclimatization to high altitude could be a secret weapon that helps them to progress out of their group. If they can hold other strong teams in their group, like Brazil and Croatia, to a close scoreline in the first 60-80 minutes of their matches, they will likely have a slight performance edge in the final 10-20 minutes and could steal a goal to secure a tie or a win. We will have to wait and see what happens in 3 months’ time.